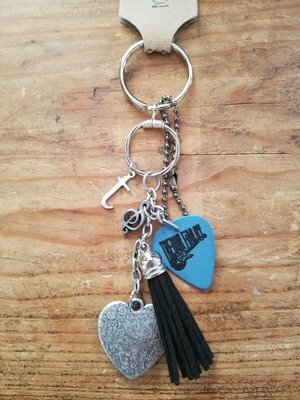 The Trevor Finlay Collection showcases a line of hand-crafted jewelry art created with award winning guitartist/singer/songwriter his salvaged 6 strings. Each piece of the unique jewelry is designed and created by hand using his upcycled guitar strings exclusively, as well as a variety of materials such as glass beads and metals or any other interesting materials the designer finds to create with. 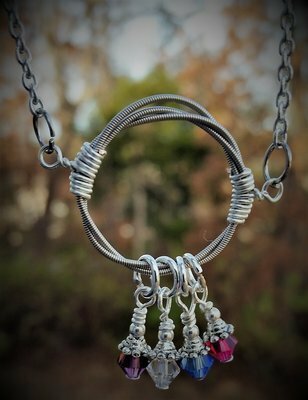 The one-of-a-kind jewelry is refurbished from the guitar strings of Trevor’s many guitars commonly referred to as “The Ladies”. Trevor has 2 acoustic; “Norma” & “Lady Outlaw”, 7 Electric; “Joanne”, “Sugar”, “Linda”, “Amanda”, “Michelle”, “Emma” and “Blaze”; and the one and only “Lil’ Charlie” the ukulele. Trevor plays each guitar with a passion that is filled with great emotion and tenderness. When a string breaks he carefully tucks the previously-loved string into his briefcase for safe keeping until he can turn it over to the designer where it will be reborn into a beautiful piece of artistic jewelry filled with the passion, drive and love he tenderly placed into it. No piece of Broken String Jewelry goes untouched by Trevor Finlay’s artistic hands. The gift of talent is twice submerged into the strings through his music and the creativity of the designer. "T" is for Trevor Finlay!